Since the bestselling "Titanic: The Ship That Never Sank" was published in 1998, author Robin Gardiner has unearthed a wealth of new evidence for his theory that the sinking of Titanic was a vast conspiracy, and that the ship that went down on April 12 was in fact Olympic, Titanic's sister ship, and the sinking was planned as one of the world's greatest insurance frauds. To the present day the most common maritime insurance fraud involves changing identities of ships. But tragically the planned staging of the sinking of Titanic, whereby other ships from the company would be on hand to rescue all the passengers and crew, went disastrously wrong and 1500 souls perished on the supposedly unsinkable ship's maiden voyage. 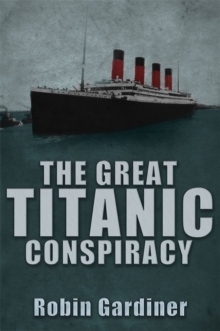 This book concentrates on the conspiracy, with evidence of why the White Star company intended to defraud the insurance company by swapping the identity of Titanic and the recently damaged Olympic in a collision with HMS Hawke, with new conclusive photographic and documentary evidence of the swap. The story starts with financier J P Morgan's takeover of White Star and the Royal Navy's investment in the company's new liners as potential troop carriers. Following the Agadir crisis in 1911 Morgan began to ship gold and other treasures back to the safe haven of the US. The pressure on White Star to make up the cost of the damage to Olympic, which the insurance company would not cover, through swapping the identities of Olympic and Titanic, was also the opportunity for Morgan with the collusion of the British government, to quietly ship GBP8 million of gold to the US. But unbeknown to the government, the gold was spirited away. The subsequent staged collision with the iceberg went horribly wrong as those in charge of Titanic completely underestimated the scale of the panic and the ensuing disaster as the ship quickly sank and the rescue boats failed to arrive became a disaster that would reverberate around the world. This gripping account recounts the author's theory on the whole build up to the disaster and its aftermath in which all parties were involved in collusion, conspiracy and cover-up on an unprecedented scale. Is it true or is it fiction? Only the reader can decide.